Introducing the 72 in. Industrial Ceiling Fan. It is designed to significantly improve air circulation in large spaces like vaulted living rooms, pole barns, and industrial buildings. 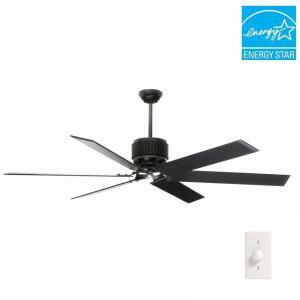 The large blades do the work-it turns at lower speeds than a standard ceiling fan yet moves much more air (CFM) because of its long 72 in. aluminum blade span. With this fan, you get the air circulation you need to regulate room temperature and keep heating costs down without the wind and breeze created by smaller fans. As a special feature, the HFC-72 can be installed as a 3 blade fan. The fan is also damp rated for use in covered porches, patios, and sunrooms. Tbook.com crawls the web to find the best prices and availability on Hunter Fanss and related Tools and Hardware products like Hunter HFC-72 72 inch Indoor/Outdoor Matte Black Ceiling Fan with wall control. For this page, related items include products we find that match the following keywords: "Hunter Fan" at our vendor partner Home Depot. Hunter HFC-72 72 inch Indoor/Outdoor Matte Black Ceiling Fan with wall control is one of 151 Hunter Fanss and related products listed in the Tools and Hardware section of Tbook.com If you have any questions on this product, please give us a call at 734-971-1210 during the hours of 9am - 5pm EST for assistance. Thank you for shopping at Tbook.com, the Internet Department Store!